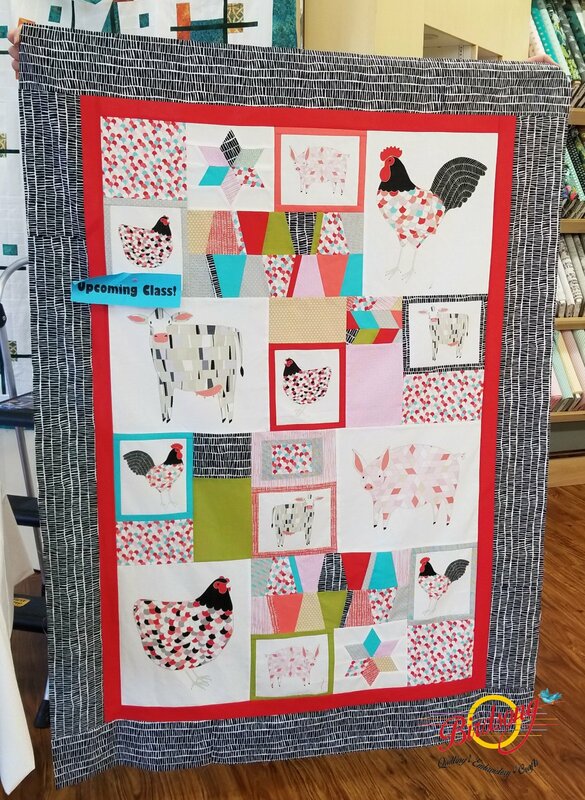 This class uses one panel of the Farm Fresh Line designed by Gingiber for Moda and is combined with other fabrics to make a wonderful lap size quilt. Our instructor has used a variety of different blocks to surround the farm animals including stars and a tumbler block. Materials Included: The Panel is included in the cost of the class. Requirements: Please bring your basic sewing supplies and your sewing machine. If you would like to sew on one of our machines please let us know in advance so that we can move one to the classroom in time for class to begin. Also bring scissors, pins, a rotary cutter, a quilters ruler and thread to match your project. The cost of this class includes the fabric panel but you must select and provide your coordinating fabrics. Please call or stop by the shop for specific fabric requirement.